Remove the gear shifter "knob" by turning it counter-clockwise. 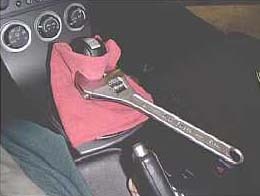 If you are having a hard time, put a clean rag around the base of the shifter and use a wrench to loosen it up. Then unscrew the rest of the way by hand.